The MyMessages™ service allows you to prepare messages to be delivered after you have passed away. The messages are unlocked by your Keyholder(s)®, but only visible to you and the recipient. Share the location of your Will and important documents. Describe assets to your Executor that would otherwise be undiscovered. Pass on a personal message to a friend or loved-one. List your login credentials for a digital Executor. Include important instructions for the handling of your possessions. In the above sample, we show you the main components of a message created using the MyMessages™ service. You include the recipient and subject line. 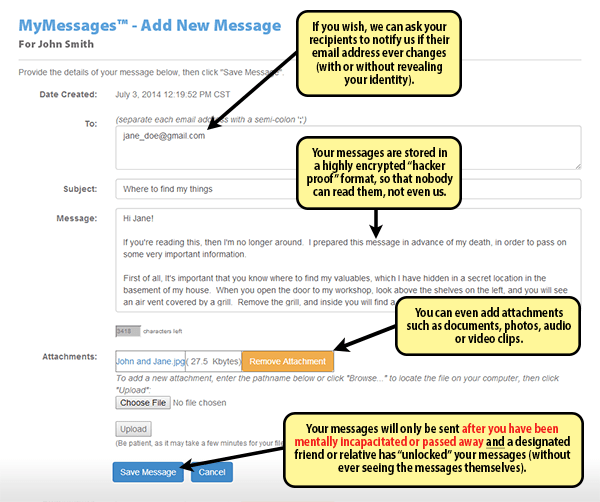 You then create the body of your message that will be stored on our server in an encrypted format. You can also attach a file to the message, such as a Word document or spreadsheet. You then save the message. After you have passed away, your Keyholder(s)® can trigger the release of the messages. Our Keyholder® System has controls in place to ensure that messages are not released prematurely.